When we moved in to our new house the showerheads, like the lightbulbs, were something from a previous era. Taking a shower felt wonderful, and rinsing my hair was like standing under a waterfall. My guess is the showerheads gushed between 4 and 5 gallons per minute. That’s twice the flow of any showerhead you can legally buy in the US. It couldn’t last. When we moved in to our new house the water in the kitchen sink would ricochet off our hands and get us wet around the tummy. It was hard to modulate the flow of water. The sprayer was so powerful it vaporized the water into a fine, Niagara Falls-type fog. The kitchen faucet was very unpopular. When we moved in to our new house we suddenly had twice as many bathrooms as we’d ever had before. We needed two shower curtains, two bars of hand soap, two floss dispensers, more towels, and there were two toilets to think about. Toilets really do take some thinking-about. One, they have to work, and by this I do not mean that it makes a swooshing noise when you press the lever, and stops running the water when the tank is full. No, I mean the flushing has to be effective. Two, the toilet can’t use as much water as a quick shower to do the job. This may not seem like a basic toilet function, but it is. They’re just not allowed to be water hogs. Our toilets were water hogs: at least 5 gallons per flush. I kind of like finding houses like this one, where there have been no energy upgrades, ever. You can really make a big difference in homes like this, and usually pretty easily. We replaced some stuff and installed something new; probably we’re using 30% less water than we would be using if we hadn’t changed anything. But, really that’s not enough. We haven’t changed some important things, and our water use should be another 25% lower than it is. Whenever you’re trying to reduce your consumption it’s useful to know what your big consumers are before you make any big changes. Otherwise, it’s kind of like going on a diet by swearing off liver pate. If all you ever eat is french fries and jelly beans, cutting out the pate will do nothing for you. Here’s a quickie on where the average American family’s water gets used. Big water uses like toilets should be the first target of water conservation efforts. We don’t water our lawn, but in some parts of the country, outdoor water use adds 50% to the daily water consumption. Daily water for a family our size is generally 300-400 gallons per day. Yikes! So, save water by focusing on toilets, showers and clothes washing. Leaks are avoidable and 100% waste. Zero tolerance on leaks. Our clothes washer is highly energy- and water-efficient, so our first step was to replace the showerheads with 1.5 gallon-per-minute handheld models. I like the handheld models because it’s easier to clean the tub and the dog. But I never give the dog a bath and very rarely scrub the tub, so that whole handheld thing is pure delusion. I just wanted you to know that handheld showerheads come in low-flow versions. Are they as wonderful as the showerheads we got rid of? Hell no. It takes me about three hours to rinse my hair, and when it’s cold out the shower makes me colder instead of warmer. But we’re all pretty well used to them by now, and when I think about the showers I’ve had in foreign countries I figure anything more luxurious than our 4-hole high velocity drip is pure American privilege. Next we put a pressure reducer on the house water supply. Nicholas measured the water pressure and it was twice what it should be. That explains the splashing water in the kitchen sink, and why both tub faucets leaked (high water pressure wears out valves). Now our water pressure is 50 psi. Everybody is ok with the kitchen faucet; it’s easy to control the flow rate and it doesn’t splash. Nicholas replaced the tub faucets with pressure-balancing ones, which took care of the leaks and fixed the problem with the shower going cold when someone uses water somewhere else in the house. We’ve got a couple of Freakshow things going on with our water use… I use the water from the dehumidifier in the house plants, and Nicholas keeps a bucket next to the shower for collecting the discard water that comes before the shower runs hot. That makes up about one flush a day. Our toilet probably flushes 5 gallons. But it matches our floor, so I like it. And that brings us to the toilets and my yellow bathroom. My best guess for when the addition was built is right around 1980. I base that mostly on the style of the bathroom, but also on the siding and electrical. 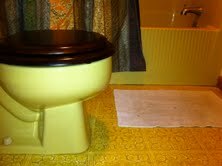 We have a yellow tub, yellow vinyl floor, a yellow toilet and a yellow curtain that came with the house. We bought yellow towels to go in that bathroom. I can’t get rid of our toilet; it goes with the room. And yet, every time we flush we’re using five- to eight-times as much water as a water efficient toilet uses. If as a family we flush 16 times a day, that’s 23,300 gallons a year wasted. At our municipal water rate of $8.77 per CCF (that’s 100 cubic feet; and you thought studying roman numerals was a waste of time!) we stand to save $273/year. Dag, that’s a one year payback on a new toilet. Do you think I can still get one in yellow? We happened to be in DC on the 20th anniversary of Earth Day a few years ago. On the Mall there was a big fair of environmental-themed tents. The kids’ favorite was a tent for the Avatar movie. They stood in line for about 2 hours to get painted like a Na’vi. My favorite display was in the EPA tent where they had a demonstration of how they measure the flush effectiveness of toilets ( MaP testing). The testing involves little condom-type things filled with 350 grams of soybean paste. An approved toilet needs to flush at least 350 grams. The best toilets flush 1000 grams. Whoa! One method of reducing water use in a pre-existing toilet is to put a brick (or more than one) in the tank (to fill up space in the tank that the water would otherwise take up). A very effective method if the toilet still proves effective.